Durabond Powdered Metal Valve Seat Inserts 30,000 series 2.160"OD x .375"
Modern engines put much higher levels of thermal and mechanical stress on valve seat inserts. To handle the more severe conditions within this new generation of engines, the OEM is equipping them with high tech sintered valve seats. The normal cast chrome and other alloy iron seats will not adequately withstand the demands of this new engine environment. Dura-Bond’s patented materials and processing of these powder metal valve seats offer excellent machinability, along with low wear and high heat resistance. These inserts have finely dispersed tungsten carbide residing in a matrix of tempered tool steel and special alloy iron particles to provide all the properties an application requires. Special compositions and processing have been developed to perform in the most extreme duty applications. Complete in-house capabilities, from development and tooling to testing, reduces lead time and cost. The 30000 Series is the most machinable of our valve seat materials. it is a sintered valve seat insert which offers a blend of finely dispersed tungsten carbide residing in a matrix of tempered tool steel and special alloy iron particles. The superior machinability is the result of adding our proprietary ingredients and solid dry lubricants to this blend, and by using our special processing techniques during manufacture. This very machinable exhaust seat material is designed for unleaded fuels. The 30000 series is intended for the light to medium duty range. For the heavy or extreme duty use range we recommend our 70000 series valve inserts. Dura-Bond has taken full advantage of the new powder metal technology to product a “hard” valve seat which will machine almost like cast iron. The magnified picture will tell the story. 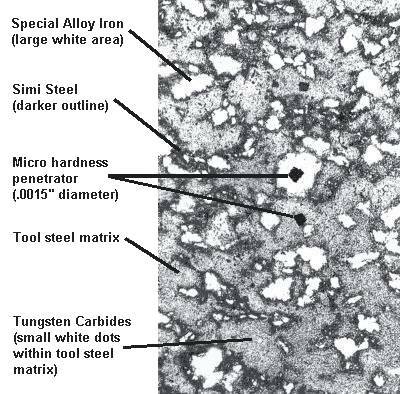 Powder metal technology allows us to place a special high grade alloy iron (with its natural, tool lubricating graphite rich properties) within a tempered tool steel matrix. Because of our special processing, we are able to get very fine, spheroidalized (round shaped), tungsten carbide particles to evenly disperse within the tool steel. These sphereoidalized carbides are easier to machine because the tool bit can wedge in-between, with less cutting force and less friction. The smaller these “balls” of carbide, the easier it is on your cutting tool, because it will not be hitting any big irregular shaped “iceberg chunks” of carbide.